Apples of Gold presents a beautiful Lenten Cross pendant as a blessed reminder of your faith. The 14K yellow gold cross pendant is etched on the arms of the cross and rendered with elegant carving on the edges. 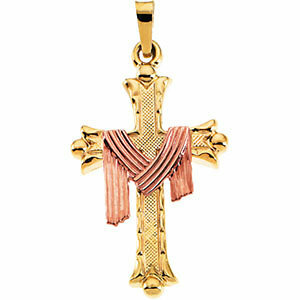 The 14K rose gold symbolizes the Lenten cloth, carefully worked over the golden cross. The rose gold is also expertly carved to replicate the draping of fabric. This symbol of faith brings to mind the importance of the season of Lent in a truly remarkable way. 25mm x 18mm (1" x 11/16"). We guarantee our "It Is Finished" Cross Pendant 14K Rose and Yellow Gold to be high quality, authentic jewelry, as described above.